Glutamate, the principal fast excitatory neurotransmitter in the brain, acts principally via two classes of postsynaptic ionotropic glutamate receptors, NMDARs, and AMPARs. NMDARs make little contribution to basal synaptic transmission due to voltage-dependent Mg2+ blockade but are essential for producing different forms of synaptic plasticity in AMPAR-mediated synaptic transmission, including long-term potentiation (LTP) and LTD1,25. Both LTP and LTD are believed to be intimately associated with learning and memory and with the refinement of neuronal circuitry during development and under pathological conditions6,22. As such, examining the mechanisms mediating the plastic changes in AMPAR-mediated synaptic transmission has been a subject of intensive research in many laboratories around the world. Although LTP and LTD can be observed in many brain regions, those occurring at hippocampal CA1 synapses are the most well-characterized and best understood examples. It is well accepted that the induction of both LTP and LTD at these synapses requires the activation of NMDARs1,25. However there is an emerging consensus that changes in AMPAR function are critically important to the maintenance (expression) of LTP and LTD2. Broadly speaking, modification of AMPAR function could be achieved by altering receptor gating properties, such as single channel conductance or mean open time, and/or the number of individual receptors. Indeed, a large body of evidence supports a critical role for rapid changes in the number of postsynaptic AMPARs in the expression of LTP and LTD2,3 Moreover, these recent studies indicate that, as with most integral plasma membrane proteins, AMPARs undergo constitutive cycling between intracellular compartments and the plasma membrane via vesicle-mediated plasma membrane insertion (exocytosis) and internalization (endocytosis). Regulation of these processes can lead to rapid increases2,26,27 or decreases2,4 in the number of AMPARs expressed in the postsynaptic membrane, thereby providing a powerful means of altering synaptic efficacy. 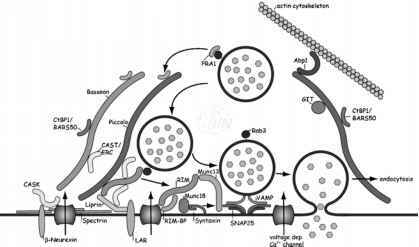 Thus, while the expression of LTP involves a facilitated insertion (exocytosis) of AMPARs into the postsynaptic membrane, LTD expression is absolutely dependent on clathrin-mediated AMPAR removal (endocytosis) from the synapse2,3.